Today’s post highlights an important yet often forgotten element in music education. Most pupils take instrumental exams at some point in their musical training and are therefore familiar with aural and sight-reading tests; nearly all practical exams have these elements, irrespective of level. However, a much broader based training is necessary if pupils are going to become rounded and complete musicians. Even if a student finds the supplementary tests in instrumental or vocal exams straightforward, they would still benefit from more practical based musicianship exercises; one solution could be Practical Musicianship Exams. The ABRSM (Associated Board of The Royal Schools of Music) have a series of graded tests (1-8) covering a whole spectrum of skills which are different yet comparable to those found in the conventional aural tests. Practical Musicianship exams can be taken instead of the Theory exams; most notably, Grade 5 can be supplemented for Grade 5 Theory. Subjects covered are similar to some of those featured in the Aural tests at the early grades, but from Grade 6 onwards, there are differing worthwhile tests. Pupils are required to sing or play some tests from memory, diatonic melodies (in more extended, complicated examples than those found in traditional aural exam tests), middle or lower part melodies, melodies with added expression, articulation, dynamics. There are also memory tests where the candidate is asked to play back, as well as transpose at sight, and recognise changes in a short musical extract. Answering questions about an extract from a score is another valuable test too. The real benefit to any practical musicianship test must be the element of harmonisation, and ‘free’ playing or improvisation which is promoted in the advanced grades. If the keyboard is not a student’s métier, then practical tests can be played on any instrument. It’s the element of thinking ‘on the spot’, which builds the foundation for advanced study. Theory exams are a great tool for understanding and practising harmony and counter-point; they could be considered the ‘first stage’ of learning, however, the realisation of harmony is truly grasped whilst improvising or harmonising at the keyboard. Useful exam tests include continuing a two bar melody by elongating to last eight bars, realizing a short figured bass passage by adding the required chords, and performing a ‘free improvisation’ based on a given poem. Whether students decide to take an exam or not, keyboard harmony should perhaps be introduced into weekly practice regimes. Learning how to harmonise at sight and to assimilate figured bass are skills which are perfected over a period of time and with regular cultivation. Once basic harmony is understood, pupils can begin to harmonise, so here are a few suggestions and ideas to implement during practice sessions. 1. An understanding of basic triads (or chords which use the root or tonic, third and the fifth notes of a scale and are built on degrees of the scale) and chordal progressions is needed, so ideally some theory must be studied first. The example below shows how triads are built on each degree of the scale (in C major here), and it’s these which form the basis for harmonisation. Then, for those with sufficient keyboard skills (possibly Grade 5/6 level), start by playing cadences (i.e. the ends of phrases and pieces which normally consists of just two chords). Work out basic cadences: Perfect (which uses chords V–I), Imperfect (chords I, II, IV or VI to V), Plagal (IV-I) and Interrupted (generally V–VI) cadences, listening to how they sound and feel to play (you might find it useful to write them out first on manuscript). You could practice playing them in all different positions around the keyboard. 2. Now play those cadences in every key; it’s probably best to work through the keys methodically adhering to a pattern such as the circle of fifths or fourths. 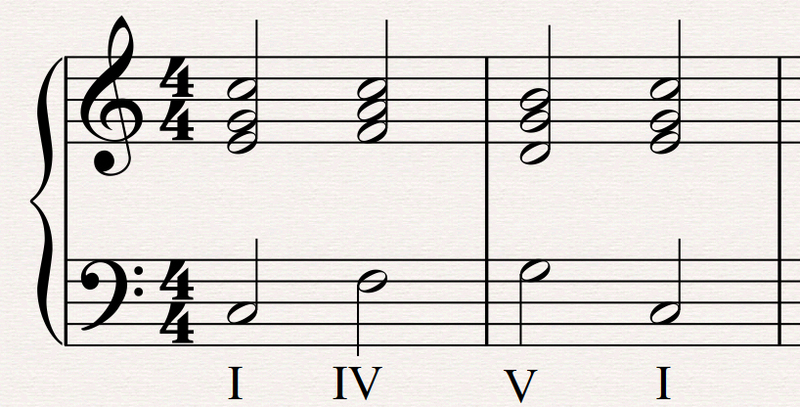 Once you are familiar with these chord patterns, more chords can be added to each cadential point, so that you end up with a four or five chord cycle such as; chords I – IV – V – I (or tonic, subdominant, dominant, tonic chords, see example below). Incidentally, this simple chord cycle is one used often in pop music, sometimes repeated ad infinitum over an entire song. Again, try to work at these chords in all keys and observe the bass note in every chord as this is the key to successful harmonisation. The feel and sound must be noted and assimilated, as it will prove crucial when playing on the spot, adding chords to melodies. 3. Once basic chords and their patterns are thoroughly ingested and can be played without too much thought (i.e. without having to slowly work them out), look at fairly simple melodies (perhaps those consisting of two or three four bar phrases), and decide how and where to harmonise by adding chords (either in the right hand or splitting the harmonies between two hands; the latter takes some practice). Sometimes one chord per bar will suffice if the tempo is quick. Next, play the harmonisation slowly at the keyboard adding the melody at the top of the texture. Concentration is key to begin with, and rather like sight-reading, it will all become easier and quicker over time. 4. Practice simple harmonisation for a while before negotiating Figured Bass, which is another type of harmonisation where symbols and numerals written under the Bass line indicate certain intervals and chords. 5. Reading through and studying hymns can be particularly helpful when learning to harmonise (and good sight-reading practice too!). Mentally take note of the chordal progressions, which will become more familiar. It’s also possible to notice the same patterns appearing countless times. Start by opening any hymn book, and also get a copy of J.S. Bach’s 371 Harmonized Chorales and 69 Chorale Melodies with Figured Bass (Riemenschneider), which are fun to sight-read and are a good place to begin. There are, of course, many other useful materials and resources. Melodies of popular songs are another never-ending source of suitable harmonising material. 6. After a period of study the basis of harmony and harmonisation will have been learnt and the student can begin to experiment with improvisation. Sometimes just creating a ‘mood’ or atmosphere in a short simple improvised passage of a few bars, is necessary to start with, again, slow-moving harmonic progressions (such as those suggested above) will form the backbone of any melodic exploration. These stages may take some time and pupils do need to be fairly fluent at the keyboard (or any instrument) to harmonise and improvise effectively, but it’s definitely a productive and interesting area of musical study to be encouraged in lessons. Thank you for posting this write-up on Practical Musicianship. It is one of the exams which has very few resources. Apart from the 371 Harmonized Chorales book, are there any other resources that you can recommend – websites/books that can be helpful to prepare for the exam. Thanks Melanie. Dorothy Pilling’s book looks good. I looked into the books from Paul Harris, but i couldn’t find anything specific to PM. He has books on sight reading, aural and others topics. Apart from harmonization. I did come across few books on Keyboard musicianship by other authors. Let me know if you can think of any other books or books on specific skills (like harmonization you mentioned above) so that will help me narrow down on .